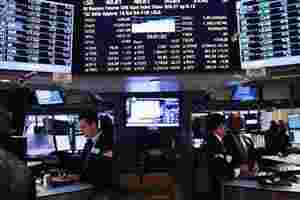 New York: US stocks rose on Thursday, putting the S&P 500 on the cusp of finishing out the year higher as another decline in jobless claims pointed to further improvement in the labor market. The latest bit of optimism on Wall Street came from a drop in weekly claims for jobless benefits to a 3-1/2-year low. Also helping equities, US consumer sentiment improved in December, hitting its highest level in six months as Americans felt better about the economy’s prospects. “This is supportive of the fact that the economy is gaining momentum and that the fourth quarter will be much better than people were expecting even just a month ago," said Jim McDonald, chief investment strategist at Chicago-based Northern Trust Global Investments. Cyclicals, which have come under pressure recent from uncertainties over global growth, were the day’s top gainers, with financials gaining 2.1%, followed by energy up 1.1% and materials, up 0.9%. Consumer staples, considered a defensive play, was the weakest sector, falling 0.2%. The Dow Jones industrial average was up 61.84 points, or 0.51%, at 12,169.58. The Standard & Poor’s 500 Index was up 10.29 points, or 0.83%, at 1,254.01. The Nasdaq Composite Index was up 21.48 points, or 0.83%, at 2,599.45. The CBOE Volatility index, a gauge of investor fear, fell 1.4% and is down about 13% so far this week, putting it on track for four weeks of declines. Recent gains have lifted the S&P 500 above its 50-day moving average, though the index has run into trouble when it sought to move above its 200-day moving average, currently around 1,260. The levels have been key for the market this year. Lower volume ahead of the Christmas and New Year’s Day holidays has left the market susceptible to the heightened volatility this week. Investors warned that a year-end rally would not necessarily translate into elevated expectations for 2012 because many of the issues that hit the market this year, such as slow growth and Europe’s debt crisis, remained unresolved. “Next year will be a tug of war between better economic data here and the prospects for emerging market growth to pick up on one hand, with the European debt crisis on the other side of the rope," said McDonald, who helps oversee about $650 billion in assets. A downward revision of the US Commerce Department’s figures on third-quarter economic growth had little impact on stocks, with investors focused on the economy’s performance in the fourth quarter. The Commerce Department said the economy grew at a 1.8% annual pace in the third quarter, down from its prior estimate of 2%. Micron Technology Inc jumped 15.7% to $6.41 as investors looked past limp quarterly results announced late Wednesday and focused on a potential 2012 rebound in long-stagnant memory chip demand and prices. Tibco Software Inc climbed 8 percent to $23.76 after the business software maker forecast first-quarter revenue above estimates and said fourth-quarter profit and revenues soared. American Greetings Corp slumped 21.1% to $13.39 after third-quarter profit dropped nearly 40% and warned 2012 cash flow would be hurt by higher expenses. Almost three-fourths of stocks traded on the New York Stock Exchange closed higher while 63% of Nasdaq-listed shares ended in positive territory. Volume was light, with about 5.88 billion shares traded on the New York Stock Exchange, the American Stock Exchange and Nasdaq, below last year’s daily average of 8.47 billion.